Wow. Just, wow. I’ve been meaning to make carnitas tacos for at least a year now, and can’t believe how wonderfully they turned out. I started with a recipe from Elise’s site and made some modifications based on some of the comments, and changed the toppings to suit our tastes. Moist, spicy, fall-apart pork, crisped up in the oven and placed in a tortilla with homemade pico de gallo, crunchy cabbage, and sweet-tangy pickled red onions. This might be my favorite dish we’ve made this year. Wow; do you smell that kitchen? The kitchen? Try the whole house! I’ve been drooling for the last three hours! This is awesome — and amazingly simple for the results. It’s somewhat time-consuming, but most of it is unattended. The most complicated part was carving up the pork and trimming off most of the fat! Seriously? That rules — I think this is one of the best meals we’ve had in a while. Home-cooked or at a restaurant. Everything works so well together: the savory pork, the freshness of the pico, and the tartness of the onions… I love it. You go ahead and keep talking about how good it is — I’m going to shut up and eat. Actually, I think I’ll join you. In a large, heavy saucepan over medium-high heat, combine pork, broth, and salsa. Add water to completely cover the meat, if needed. Cover and bring to a boil. Reduce heat to low and simmer, covered, for 3 to 4 hours, until meat pulls apart easily. Remove the meat from the liquid in the pot, set aside, and shred. (I use “shred” lightly, the pork will be so tender that just pressing it with the back of a fork will make it fall apart.) Pour the liquid through a colander to filter out solids, then return a third of the liquid to the saucepan. Heat over high heat for 12-15 minutes until it reduces to a gravy-like consistency. Add the reduced liquid to the pork and mix thoroughly. Turn on the broiler in your oven. Place the shredded pork in a shallow layer in a roasting pan, or a wire rack over a cookie sheet, on the bottom rack of the oven. Broil for 5-7 minutes, until pork starts to crisp up. Use a spatula to flip the pork, and broil for an additional 5-7 minutes until crisp. 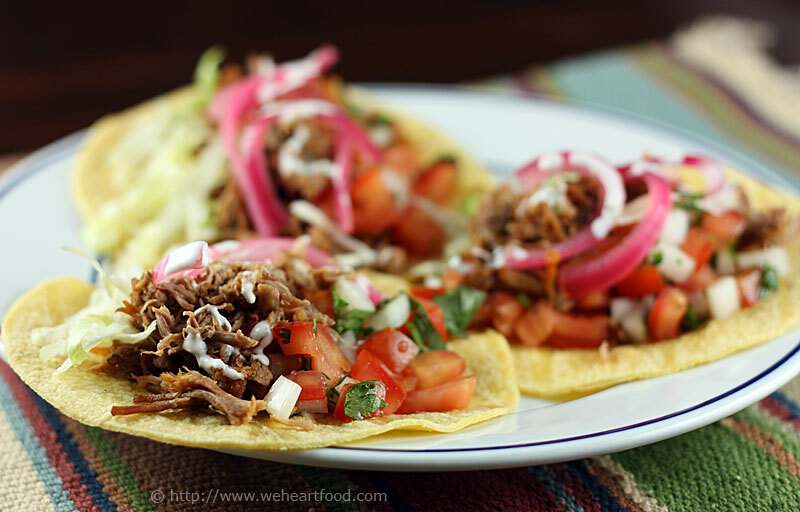 Serve the carnitas in warm corn tortillas with homemade pico de gallo, marinated red onions, and shredded cabbage. Drizzle with a little creme fraiche. Blanch the red onions in boiling water for 15 seconds, then drain, rinse, and pat dry. Dissolve the sugar into the rice wine vinegar. Place onions in a shallow dish, then add rice wine vinegar to just about cover the onions. Add about 1/4 cup of orange juice (enough to totally cover), the oregano, a few peppercorns, and a few coriander seeds. Cover and refrigerate for at least 2 hours. These will keep for about a week in the fridge.